It could happen one day, but for now, it’s happening Down Under. The play will document the story of the AC/DC signer through his various bands - including the Spektors, the Valentines and Fraternity - before he went on to become the second singer for AC/DC. Australian rock legend Doug Parkinson will also tell part of the story; Parkinson and Scott started their careers in the pubs of Australia at the same time. 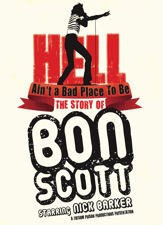 “Hell Ain’t A Bad Place To Be – The Story of Bon Scott” will have a two-week residency at the Anthenaeum Theatre in Melbourne starting July 12.